This is cute, but it's not really a good antithesis. How about "Science lets you bomb civilians from the sky without any danger to you"? Or "Science lets you shred unarmed civilians with machine-gun fire via video in your attack helicopter"? Or "Science lets you kill children with remote-control drones from thousands of miles away"? Or "Science lets you cull the human race of inferior losers through eugenics"? The September 11 terrorists didn't fly into the World Trade Towers by the power of religion. (Whoa, dude, you mean they totally flew through the air? Praise God!) Like any other good soldiers, they used high technology which enabled them to do much more damage than they could have done by their own muscle power. Scientists have been remarkably willing to put enormous destructive power into the hands of politicians and generals, but that's okay because it's not for scientists to decide these things -- or so they claim. The responsibility isn't theirs alone, of course, but they must shoulder their share. At a time when Islamist extremists strap bombs to themselves and blow up women and children; when America has just come staggering out of the searing thirty-year-plus embrace of the reactionary, dumb-as-mud Religious Right; and when some people are bullying, harassing, and persecuting gay men and women in the name of religion, it's understandable that the sort of decent people most of us would want for neighbors run from religion. There is a problem, though, for those who flee religion expecting to find sanity in unbelief. The madness never was about religion, let alone caused by faith in God. It was and is about how we evolved and what we evolved into . Now, I'm the kind of atheist who agrees that "the madness never was ... caused by faith in God", since human beings create their gods. "Faith in God" is an effect, not a cause. (Schaeffer, though, still thinks there's a nice God who protects babies.) But look again at those opening clauses: he mentions "extremist" Muslim suicide bombers, but not "extremist" Christian American soldiers killing hajis as payback for 9-11, though American soldiers have killed far more people in the past few decades than Muslim suicide bombers have. America is rich, after all, and can equip its soldiers to kill more effectively and on a much larger scale. I think Schaeffer can now blame Ronald Reagan and George W. Bush for their murderous religiosity, though it will be interesting to see just how far he goes as the book proceeds. But my point is that it's easy and safe to invoke Islamist suicide bombers as a symbol of religious fanaticism, and not so safe or easy to recognize the same fanaticism on our side -- whether "our side" is America, Christianity, or science. 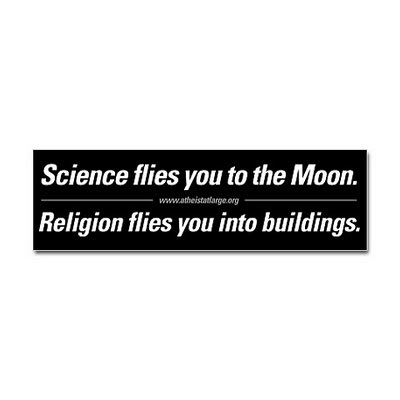 So the bumper sticker that inspired this post really is meant to paper over Western science-driven state terror. Possibly the person who designed it didn't realize that, but if so, he or she is less rational than he or she clearly wants to believe. Sarah Palin and Barack Obama Are Gay Lovers! The God Who Cried "Wolf!" I, Uh, I Forgot What I Was Gonna Say, Man!